16 Air Assault Brigade is the newest and largest brigade in the British Army. 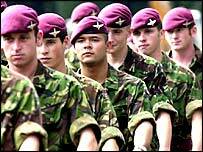 On its formation on 1 September 1999, it was billed as the most powerful airborne fighting unit the country had ever produced. It was born from the amalgamation of 24 Airmobile and 5 Airborne Brigades, and includes a combination of air assault infantry, parachute troops and helicopters. The brigade, which has about 6,000 personnel, forms the Army's primary rapid reaction force, and is prepared to be deployed for use in any eventuality. It is also a key part of the Joint Helicopter Command, which was formed in October 1999 and brings together the battlefield helicopters of all three services under a single joint command. "If you look across the world at air mobile forces, they're as good as anything the US can produce," said Major Charles Heyman, editor of Jane's World Armies. "The repository of the world's experience in air mobile forces is in 101st Airborne, and 16 Air Assault Brigade is as good as them." In 2002, the brigade was instrumental in the establishment of the International Security Assistance Force (Isaf) in Afghanistan, the United Nations-sponsored peacekeeping force deployed to provide security after the downfall of the Taleban regime. The previous year, it was deployed to Macedonia, where it spearheaded the Nato Essential Harvest operation to collect and dispose of arms and ammunition handed in voluntarily by the Albanian National Liberation Army. The brigade has a joint Army and RAF headquarters based in Colchester, Essex, which provides the co-ordination for complex air assault operations. It is made up of a large number of different units, including the 1st, 2nd and 3rd Battalions of the Parachute Regiment and 3, 4, and 9 Regiments, Army Air Corps. Its role is to move rapidly into enemy territory, paving the way for slower, heavier land-based forces. Two battalions of the Parachute Regiment are always deployed alongside a battalion of regular infantry soldiers to make up the brigade's ground fighting elements. "The brigade has the ability to put three battalions of air assault infantry onto the ground, plus regiments of artillery with 18 light guns, and that's a pretty powerful force," said Major Heyman. 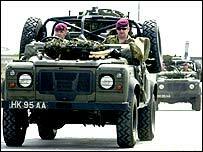 "If a commander on the ground has a threat somewhere to his flanks, he can get the air assault brigade down to attack. "They are lightly armed and lightly equipped, so the heavy forces need to get there fast. "In the Gulf, you will probably see 16 Air Assault Brigade used for difficult tasks that need looking after fast before the heavy artillery get there." The brigade suffered a recent setback when the government's spending watchdog revealed that dozens of the army's new Apache Longbow attack helicopters were to be kept in storage for four years due to a shortage of trained pilots. 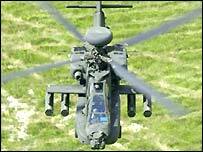 The initial £3bn order for 67 Apaches, placed with Westland Helicopters in 1995, was said to offer the greatest advance in Army effectiveness since the tank. 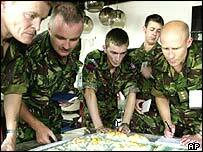 The helicopters were intended to be in service by December 2005, with 48 of them going to the aviation regiments of 16 Air Assault Brigade. But a National Audit Office report published last October warned that although the Apaches were being delivered on time, a private finance initiative deal to train aircrew was three years late - meaning 11 out of the 25 helicopters already delivered were to be kept in storage for four years. In the meantime, the Army Air Corps regiments operate Lynx helicopters armed with anti-tank TOW missiles, alongside Gazelle helicopters which provide reconnaissance capability. For mobility, they depend on support Puma and Chinook support helicopters operated by the RAF. The brigade also includes crucial combat support and combat service support units, all of which have a parachute-trained element. The Pathfinder Platoon is the brigade's advance force and reconnaissance force. Its role includes locating and marking drop zones and tactical and helicopter landing zones for air landing operations. Once the main force has landed, the platoon provides tactical intelligence vital to the operational decision-making within the brigade headquarters. Artillery support is provided by 7 Parachute Regiment Royal Horse Artillery, while 9 Squadron of the Royal Engineers provide engineer support.